Arthroscopy allows an orthopaedic surgeon to diagnose and treat disorders inside the joint through state-of-the-art instruments that provide a clear view of the joint. The arthroscopic surgeons at Orthopaedic & Spine Center (OSC) are certified to perform arthroscopic examinations, as well as perform arthroscopic surgery. Arthroscopy is one of the most common orthopaedic surgeries in the United States, and we are proud to offer this service to our patients. This technology allows our physicians to give an accurate diagnosis and provide proper treatment of joint problems, ensuring the best orthopaedic care for all of our patients. An arthroscopic procedure is far less invasive, resulting in less pain and quicker recovery times. 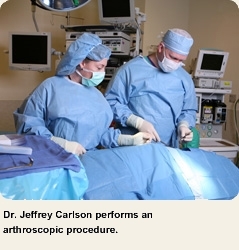 Call (757) 596-1900 to schedule an arthroscopic procedure or to make an appointment with our arthroscopic surgeons. Visit our Contact Us page for information on our location and office hours. If you are experiencing joint pain, OSC can help you improve your quality of life with a variety of solutions. Our professional specialists can help you to understand the problem and find a treatment solution that works for you. Call us today to set up a consultation appointment at our office in Newport News, VA.